“Harvesting, damage mitigation and culling probably actually accelerate population growth in roos because the smaller ones survive and adapt by sexually maturing earlier – which speeds up fertility turnover. The ACT government in Canberra is pursuing a policy of rapid human population growth, mostly through publicly invited economic immigration, yet it blames kangaroos for being crowded out of the suburbs. “Planned wildlife corridors need to be made safe and long-term viable to cope with people, car and kangaroo population movements. Most Australians love kangaroos and don’t want rapid human population growth. Australia’s capital needs to revise its growth policy in line with sustainability, democracy and appreciation of our unique ecology,” said Maryland Wilson, President, AWPC. I believe that this is just brought about by a group of bureaucrats who hate kangaroos. People do need to be more cautious on the roads between sunset and sunrise. I live in the country and I watch trucks just barreling through, they might clean up a little mob but they never ull over to see if any are alive. Maybe it is time that the insurance companies stepped in at made the Vic Roads put the night time speed limit lower than during the day when they are resting. The mass slaughter that goes on is bloody, ridiculous and could be managed in a much better way. Wake up Australia to what these people are doing. 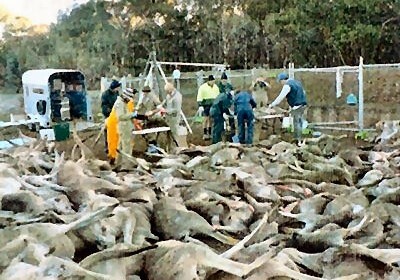 In Victoria they will cull a mob so that they can put houses up. We should be much cleverer than that we should design estates around what native animals that we have not killed off. The above should also apply to koalas. They are listed as vulnerable and is some pockets they are totally ripping out their habitat without any thought at all. How bad does it have to get. Horrible to kill ANY animals, especially like this!!!! !